I’d like to invite you to learn a bit more about bob wolf partners/TPG. Built on over 70 years of collective Agency Search experience, we’ve been around the block many times. We’ve been there and done that at the C-level as agency chiefs, as client CMO’s and as consultants to many Clients in many industries. We’ve tackled tough marketing problems and opportunities, encountered difficult personalities and relationship issues, solved organization alignment and process problems, launched new brands, repositioned others, faced various crises and more. We’ve worked hard. We’ve been challenged. We’ve been proactive. We’ve been bottom-line oriented and accountable. And we’ve had fun, too. Think of us as your Personal Consiglieri. Since 1996, our premiere agency search consultancy has provided personalized, valuable counsel to our Clients in all matters related to client-agency relationships…screening/selecting the best agency partners, improving the relationship, performance enhancement and achieving win-win financial results for all parties. Today, we live in a media agnostic environment. The agency landscape is more highly fragmented, particularly as technology impacts strategy, media, messaging and behavior…making the branding process exponentially complex. As Clients juggle, advertising, social, digital, public relations, content, direct response, influencer marketing, shopper, event-sponsorship marketing, channel/media management, programmatic, analytics and more, it’s hard to determine whether full-service agencies or niche agencies are best. And by what process these channels should be managed/prioritized to optimize ROI. 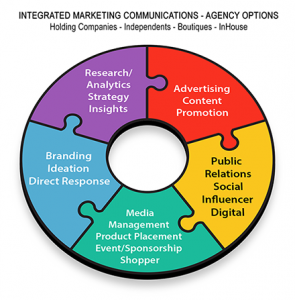 Perhaps to simplify matters, more marketers are consolidating their agency roster and creating in-house units to address certain elements such as PR, social, influencer marketing, data management, CRM, and in-store promotion. Our extensive experience, perspective, insight, process and tools are aimed at helping marketing decision-makers solve their agency concerns in a highly personalized, yet cost and time sensitive manner. Often, that means changing one or more agency partners…but don’t be surprised as we’ve helped save various client-agency relationships, too! As marketers grapple with the above considerations, not to mention the internal systems, reporting relationships, process, financial considerations and measurement of effectiveness, it’s nice to know they can rely on a smart, experienced, driven Consiglieri…expert, personal, dedicated and intensely success oriented. If you’re an agency who wishes to register, please tap the link below.